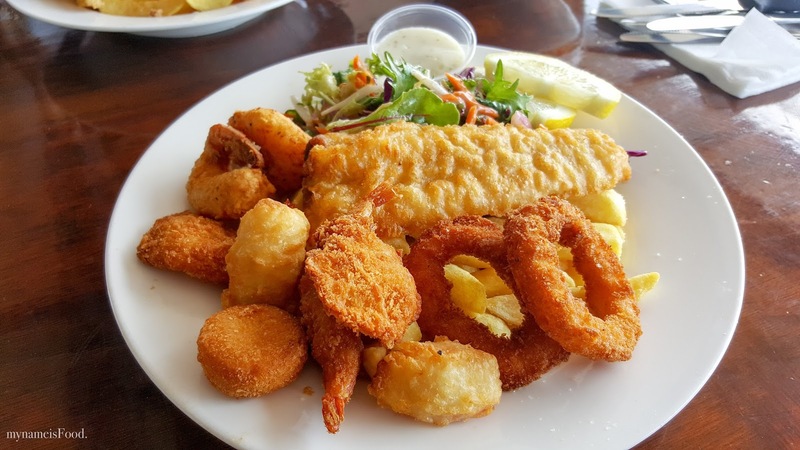 Fisherman's Wharf Tavern, Main Beach, Gold Coast - my name is Food. Sometimes seafood is something you would like to eat everyday without thinking about the health implications of it if you eat it too much or not enough. Coming here for a birthday wasn't too bad after all, especially being able to enjoy the view and the good food served. Sitting out in the open deck over looking the yachts and the ocean view, be mindful of the seagulls that do swoop past however. 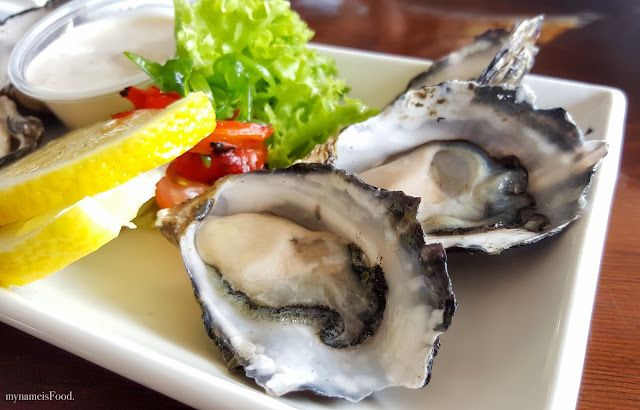 Starting the lunch with a plate of 'Natural Oysters' (Half dozen: $19.90; Dozen: $29.90) was fresh and plump. 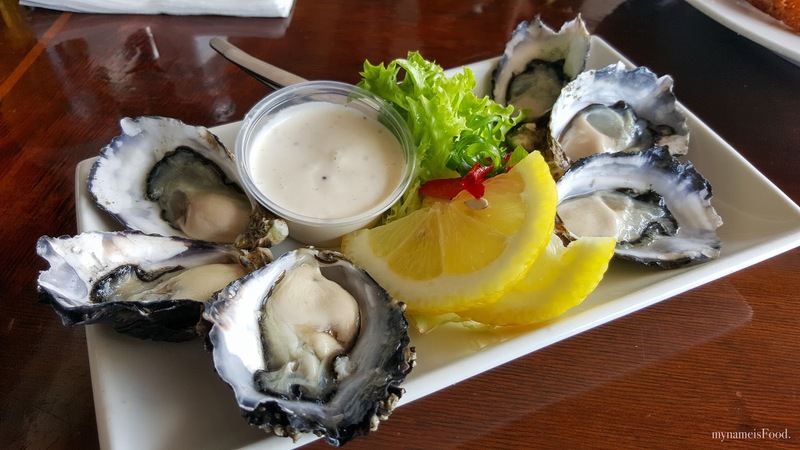 Top it all with a squeeze of lemon and I do prefer natural oysters when compared to the Kilpatrick oysters and so on. I do feel that Oysters are best when eating as is. 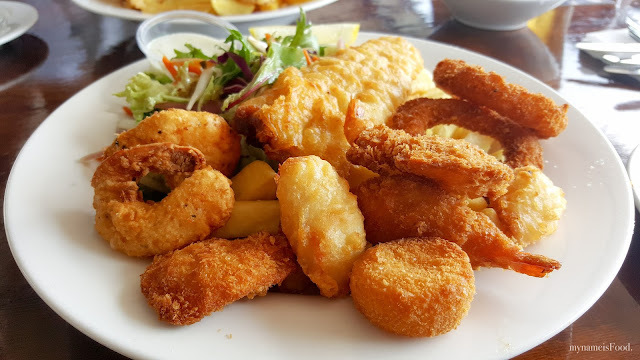 Wanting to share amongst the three of us, we decided not to go overboard nor over-order so we ordered the 'Seafood Basket' ($22.90) which had a selection of crumbed and battered seafood served with chips and a side salad. 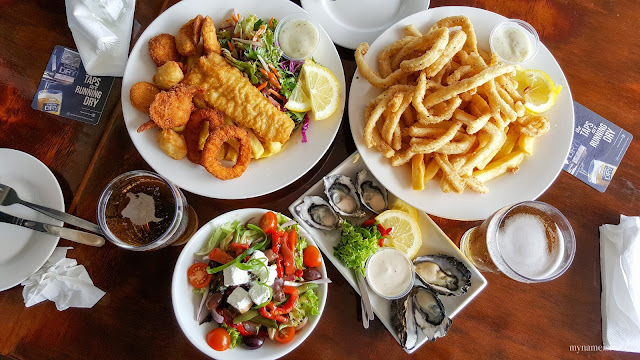 The amount of seafood variety was quite generous, I have to say as it came out in a big plate, filled to the top with battered fish, prawn cutlets, crumbed scallops, calamari and so on. 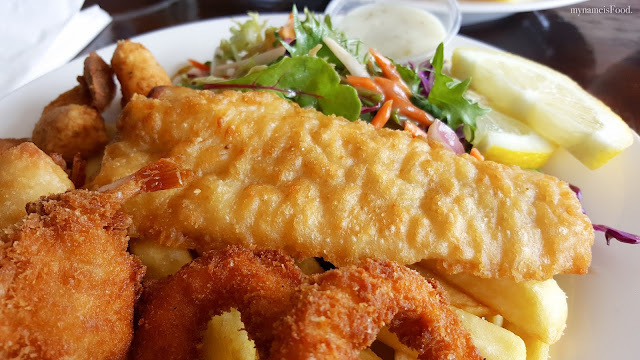 Remember to always squeeze a bit of lemon everywhere before digging in and although the salad is placed on the side, I do feel that it would've been best if it was served separately so that it won't leave the chips soggier. 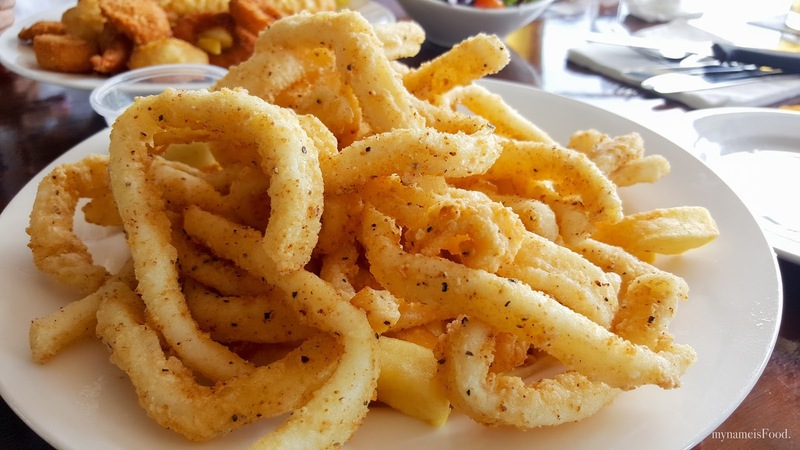 The chips were just okay, but it could've been crispier than it was. 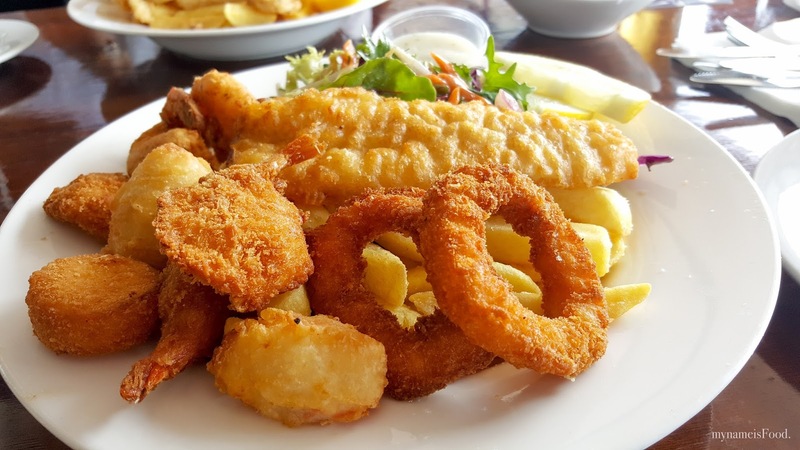 The batter and crumb was just right and had enough coverage for the fish fillets etc. and was not too thick leaving it with only little meat. 'Lemon Pepper Calamari' ($19.90) is always a classic and a favourite for many and I do have to say that they do a mean plate of calamari topped with lemon pepper seasoning. Just look at the image above and for the price, I do have to say that it is definitely a steal. 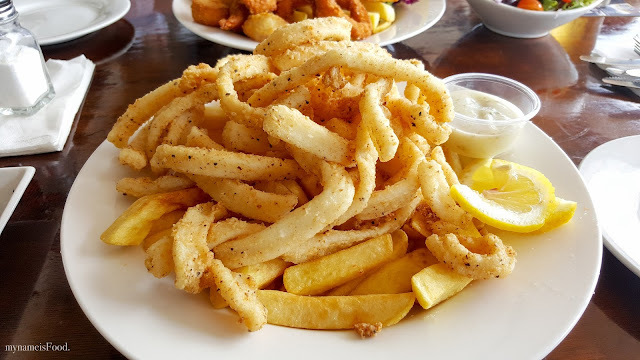 Fresh pieces of squid lightly crumbed and had the right balance of seasoning, all topped above a big handful of chips. 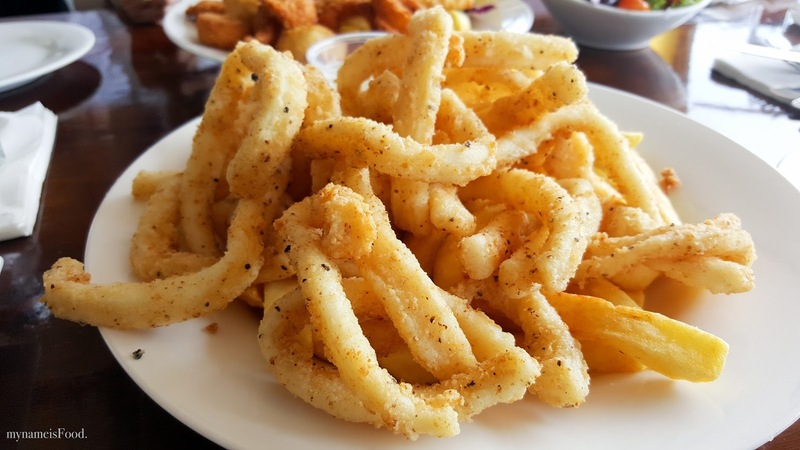 The calamari was cooked well on the inside and it wasn't the type that would make you sick after a while. 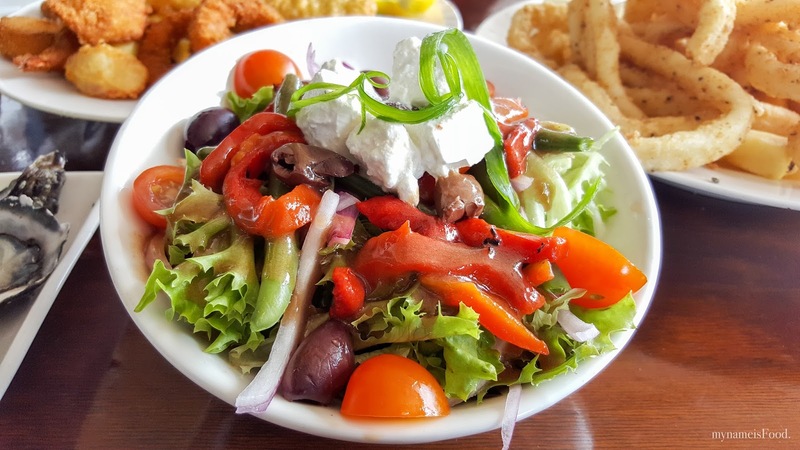 Ordering a side salad or a salad dish is always great when sharing as it helps cleanse your palate or when you want to have that little break in between during your indulging sesh on seafood. 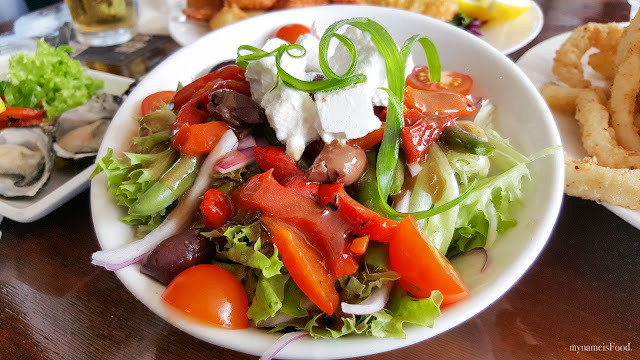 'Mixed Green Salad' ($8.50) consisted of mixed greens, feta cheese, olives, red peppers, cherry tomatoes, red onions and spring onions. A whole load of mixture in one bowl but be careful when you do try and mix it as the bowl seems to be a bit too small for it all.